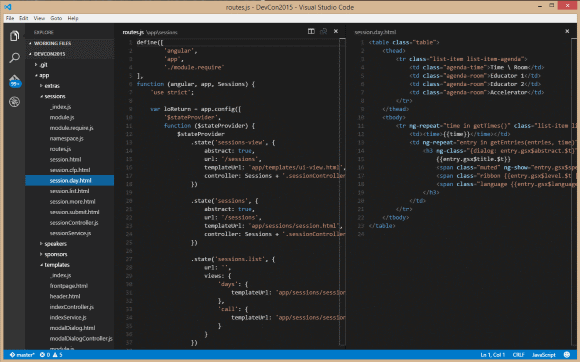 Yes, you read it correctly - Visual Studio Code, Microsoft's newly launched cross-platform text editor for quick and easy access to redefined code editing features. Surprisingly, Arnaud got in touch with me just some days prior to the event asking whether it would be suitable to actually do a presentation on Visual Studio Code - best running it on Linux, too. As I just wrote an article regarding an enhanced experience of using Code on Linux I agreed and all was set for the event to happen. Some of the Microsoft Student Partners (MSP) were already around and it seemed that another technical session on C# development was still in full swing. Great, lots of geeks and familiar faces around. Next, I spoke to Arnaud and we checked the schedule of sessions for the evening quickly. 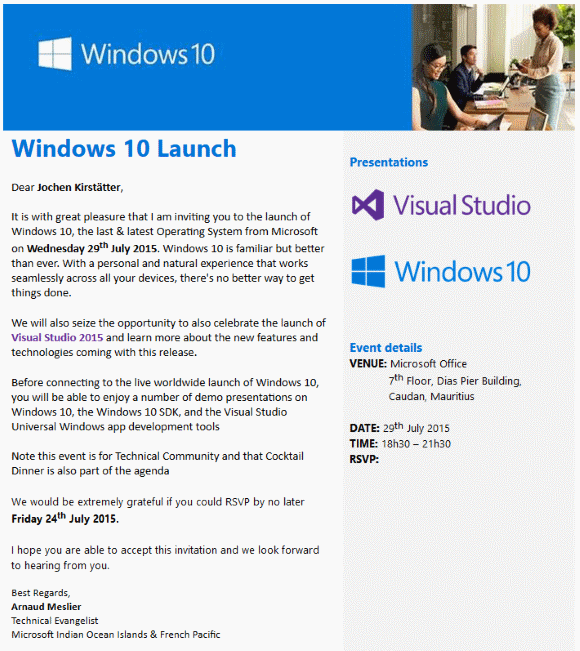 Cool, my session on Visual Studio Code is going to be the sugar icing on top of a promising evening - last one! As there was still plenty of time we went to check the available equipment for the presentation, and the fun started. As I'm using an older HP laptop running on Xubuntu 15.04 with a VGA output only but the projector didn't want to accept this input source we had to look for alternatives in order to give the audience some first hand experience with this awesome editor. Well, using an USB-HDMI converter based on DisplayLink wasn't properly recognised by the kernel and I didn't want to go through some of the pain I had with an external USB display, I suggested that I'm going to run the demo on a virtualised environment on my main machine. Luckily, I still had a freshly installed Xubuntu 14.04 as an image. Based on my own step-by-step guide and after transferring some source code folders I was ready for prime-time. Honestly, it's always great to attend social events for software developers, eh craftsmen. Those unique opportunities to meet with other geeks in the field are undeniable and there should be more events like this throughout the year. Apart from getting introduced to new peeps and got quite a number of questions regarding the past and future Developers Conference. Surely, the event back in April was a great success and personally I'm very pleased with the outcome especially after a short preparation time of less than 4 months. Right now, there are already plans and small preparations in the pipe for 2016, more to come soon. Well, it was more or less just a cameo session of roughly 20 minutes. Actually, I went quickly through the steps of acquiring Code from the official website, gave some details about the nature of the application. Code itself is written in TypeScript using web-based technologies which are then hosted in the cross-platform compatible Electron shell which runs on Windows, Mac OS X and Linux operating systems. Next, there were the steps from my guide, and after showing the shortcut entry in the main application menu it was time to fire up Code itself. Thanks to the high quality even at this early stage of Code there were no surprises and I showed some features, like the usual syntax highlighting capabilities of a variety of programming languages, the builtin image and icon display, as well as the neat integration of git client. Using the AngularJS source code and the partial views in HTML of the website of the developers conference I also demo'd the split view feature of Code. Which is actually pretty handy to have controller and view source code next to each other while developing your web sites or web applications. And last but not least, I switched virtual desktop and showed the last two, three features in Visual Studio Code on Windows, too. Just to demonstrate that the UI and user experience is identical between operating systems. Code is surely a great tool for mixed teams of software and web developers. Eventually, you might also have a look at the options to customise your key bindings - just to make it more comfortable to your personal taste. After the launch event of Windows 8 back in October 2012 where I met Arnaud Meslier first time there had been some great development in terms of ICT here in Mauritius. 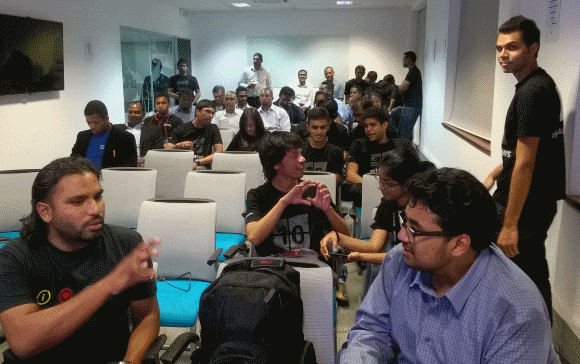 Apart from the activities of the Linux User Group of Mauritius (LUGM) and the Mauritius Software Craftsmanship Community (MSCC) there are more and more opportunities for like-minded people to meet and exchange offline. Apart from the introduction of great products and tools this evening, it was a pleasure for me to have a wide range of chats with other geeks. Working as a freelancer is eventually a dream situation for most people. But is it for everyone? What are the advantages and eventual obstacles to tackle in reward of some liberty and flexibility in life?